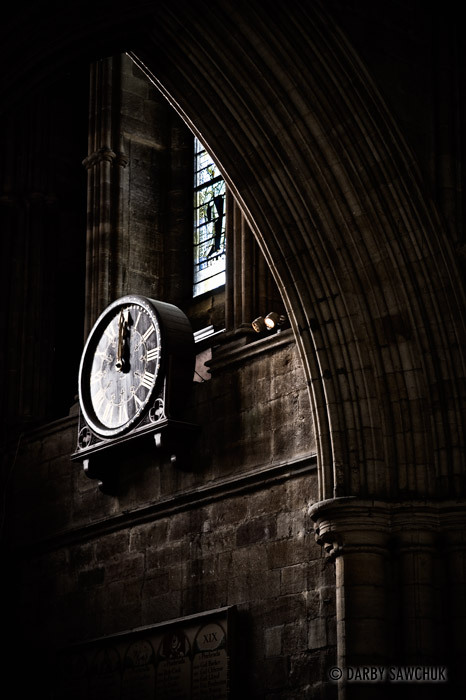 This clock near the entrance of Ripon Cathedral caught my eye on my way out. This was one of those instances where the light worked perfectly in the setting. It highlighted all the right places and left enough shadow to create some mystery. 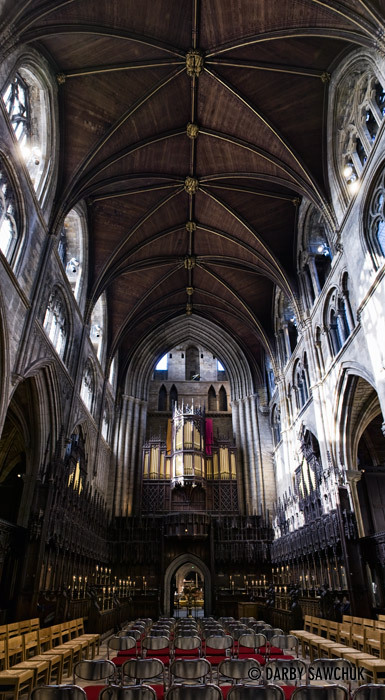 A panoramic view of the choir of Ripon Cathedral. In addition to being a sucker for massive buildings, I have a soft spot for ancient ones as well. Maybe it’s because, in my home city of Calgary, a building qualifies as old if it has a mere few decades under its belt. Maybe it’s because I grew up reading Tolkien and subconsciously romanticized every stone building I would ever see. Maybe it’s the echoes of a past life. Or maybe just simple nostalgia. Whatever the reason, I can’t get enough of England’s centuries-old cathedrals. 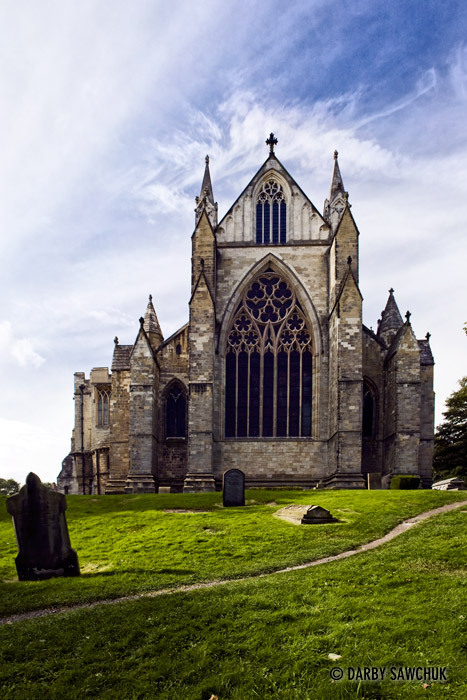 Ripon Cathedral has gone through a number of iterations, but it was begun in 672. I’d say that qualifies as sufficiently aged for me to get giddy at the sight of it. The massive scale of Fountains Abbey can sometimes only be captured via a panorama (or standing really, really far back from it). 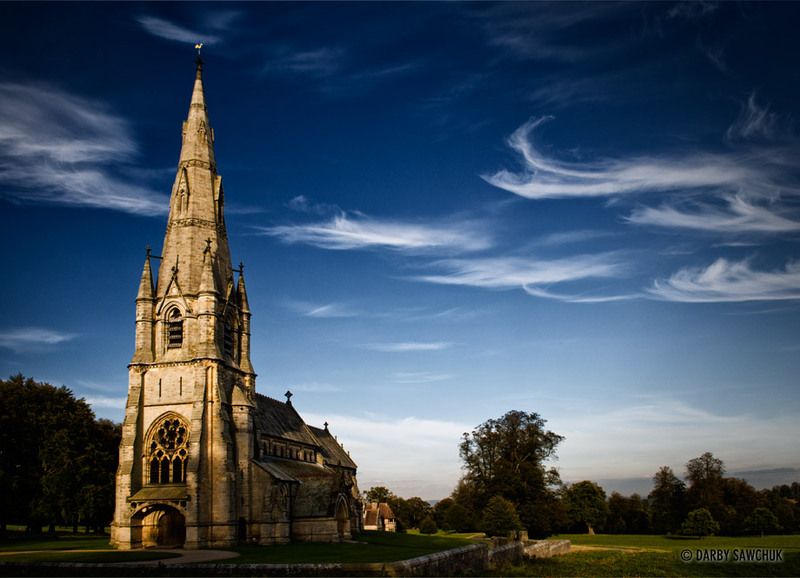 This cute church (St. Mary’s) stands alone near Fountains Abbey. It’s strangely isolated from anything around it, but that, of course, makes for a rather peaceful setting. Some wispy clouds help set the pastoral scene. 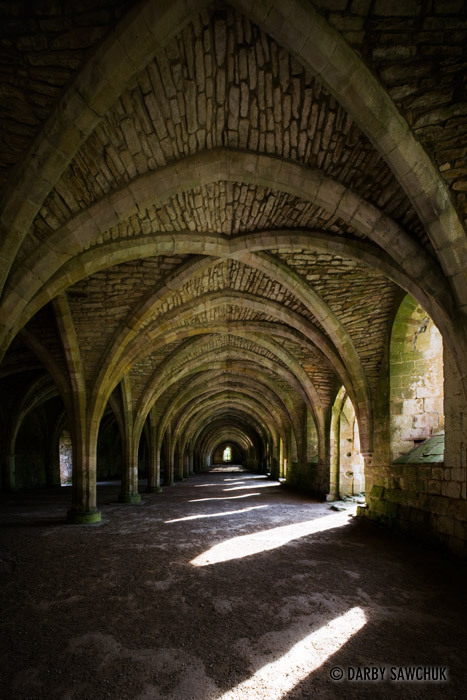 In an attempt to get back into the habit of some photoblogging, may I present you with an image of the Lay Brothers Refectory in Fountains Abbey, North Yorkshire England. I had the chance to visit both Fountains Abbey and Ripon Cathedral on the way back from the wedding I shot a few weeks ago in North Yorkshire and loved every minute of both of them. In the few spare minutes I’ve had recently, I’ve been reading an introductory architecture book that helps you to identify various styles and construction methods used over the years and to be able to see its contents in person made the learning experience a lot more vivid than mere pages would. The next photoblogs will feature the lovely Fountains Abbey and surroundings. They will be followed by a few shots from Ripon Cathedral. And after that? Well, let’s see how this works out and then then I’m sure I’ll be able to find a photo or two (hundred-thousand?) to follow.